Sunday 11 September. The Forresters, Kirdford, Chichester Start. Edwin led this ride on behalf of Phil who was away and was joined by Avryl and Adrian. Weather was overcast but dry and cooler than of late at about 18C. The route took in the climb up to Pillygreen and then along the ridge and down on the main road to Upwaltham. After a swoop down Duncton Hill the riders took a sharp right at the bottom and then lanes to Petworth for elevenses at Tiffins. The group joined Arun Adur members being Dave Galle, Richard Boulton, John Maxim and John Wickens. Arun Adur left to do a longer loop to the pub and just as we were leaving the Walberton Pond group of Harvey, Gill and Colin arrived. We continued on a direct route via Ball Cross arriving soon after opening and getting established in the rear garden. We were soon joined by Arun Adur, the Walberton group and Alan, Liz, Eric, Mike and Chris who came direct. In the afternoon we headed down to Wiggonholt via Wisborough Green and the track eventually coming out at Broomers Hill. We met up with Arun Adur again at Wiggonholt. Avryl gained a puncture just as we left Wiggonholt which was quickly fixed by Colin. Sunday 11 September. The Forresters, Kirdford, Walberton Start. Harvey led the ride and was joined by Gill and Colin. 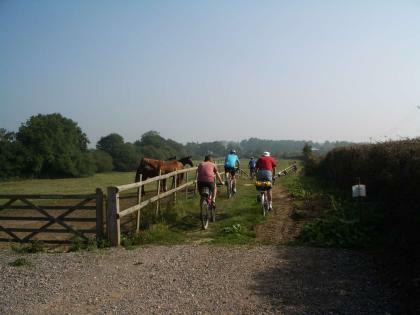 The route took in Madehurst, Houghton and then across to Bury, Bignor and lanes to Petworth for elevenses at Tiffins. The group arrived just as the Chichester group of Edwin, Adrian and Avryl were leaving. After elevenses the group continued via Balls Cross to Kirdford joining up with the Chichester group and Arun Adur at the Pub. The groups combined after lunch, see the Chichester group writeup. It was a fine afternoon with the sun breaking through in the latter part. 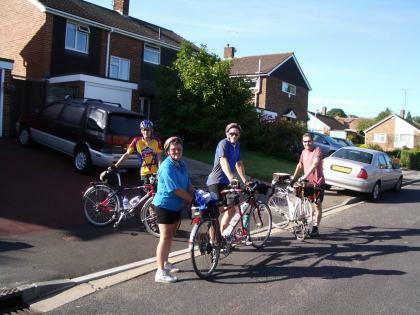 Eight people set out from Chichester library and pedalled our way via Appuldram towards the Marina. It was high tide and the lock gates were open and so we watched boats making their way out until the gate was closed to enable us to cross over. 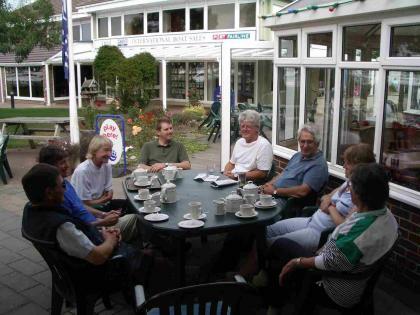 We did a short trip round Birdham Pool before stopping for tea at the Yacht Basin where we were joined by Edwin. Edwin, Alan, Liz, Avryl, Roger, Julian, Bruno, Janet and Kath all sat round a large table enjoying the warm weather and much chatter before making our way back to Chichester. Arun Crossings Ride, Pulborough Station Start. DA Event. Colin led this ride with some people riding to the start, some coming by train and some by car. I (Edwin) am writing this report on behalf of Colin. I had dusted off (literally) my Mountain Bike after several years lack of use and took the train up from Bognor. Gathered at the station from Bognor/Chichester there was myself, Colin, Chris, Richard Carlisle, Nicola and Tom. From Arun/Adur there was Dave Galle, Dave Fox, John Wickens, Richard Boulton and Barry. 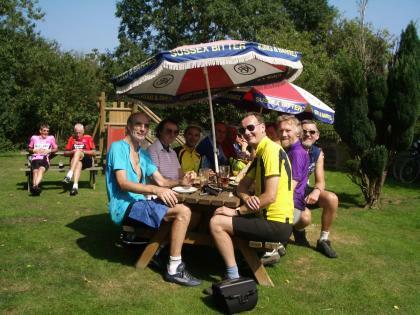 We were also joined by Bob from Billingshurst not a member of a Section who had heard about the Ride. Weather was hot and sunny reaching 26c. We took lanes north from Pulborough Station up Codmore Hill and then on a track making our first crossing of the Arun at Patlingham Quay Farm. Then more tracks coming out on the Cold Harbour road between Fittleworth and Wisborough Green. We were grateful to turn right avoiding the big climb little knowing that Colin had it stored up for the afternoon. 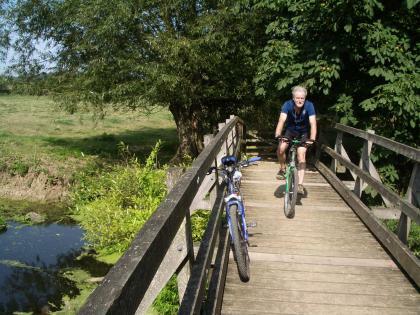 Our taste of Tarmac was short lived as we soon turned right off the road onto the Wey South Path taking us via another Arun Crossing to Lee Place and north on the track to Wisborough Green with another Arun crossing. On route we met Alan and Liz who were making their own way and joined us for Coffee at Penelopes Cafe, Wisborough Green. We continued north on more lanes and tracks to our lunch stop at the Haven. Here we met 7 riders from Horsham Section including Roger Nash celebrating 10 years to the day since he joined the Horsham Section. We also met our Walberton Pond group and John Maxim, Brian, Sue and Graham who had arrived on lightweight road bikes which were not going anywhere near any rough tracks. We continued with the ride heading south on the lane turning off onto a track at Oakhurst to cross the Arun and come out at Newpound Common and a few hundred yards of Tarmac before heading east on another track via Paplands Farm and over the Arun again and back to the lane and down to Newbridge and on to Wisborough Green for tea. We met Alan, Liz, Tom, Barry and Ernie who were making their own way. We headed south on the usual track from Wisborough Green but then took a bridlepath west. Here we encountered our first muddy patch. This was luckily quite short and in contrast with the rest of the day which had been dry and hard packed. We came out on the Coldharbour lane and this time had the steep climb of 15% plus where I engaged my emergency Shimano Super Low Megarange 34 tooth rear cog. We descended part way but then took a track across to Stopham Bridge and down to the old bridge over the Arun at the White Hart. 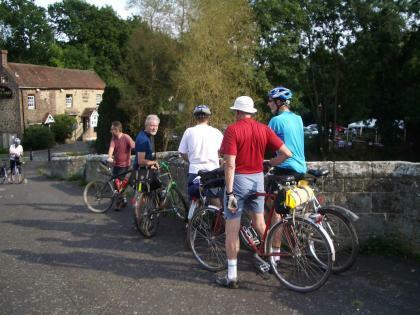 For completeness we also did the main road bridge and then back over the old bridge and on to Pulborough Station. Mileage from and back to Pulborough was 28.5. Well done to Colin for an excellent route much of which was totally new to many in the group including myself. We would plan to repeat the ride as a DA Event at the same time next year. Sunday 4 September, Walberton Pond start, The Blue Ship, The Haven. This ride was nominate Leader on the day and Harvey volunteered and was joined by Gill and Ann. Weather was hot and sunny with temperatures up to 26c. Route taken was via Madehurst, Houghton and Amberley to stop for elevenses at Wiggonholt. 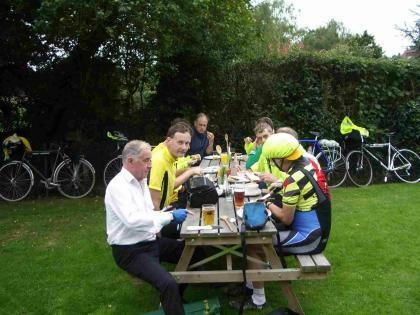 The group continued via West Chiltington and Adversane to stop for lunch at The Haven and meeting up with riders on the Arun Crossings Ride and from Horsham. The group returned via Wiggonholt and Houghton. It was a beautiful sunny day with a cloudless sky. Six riders set out from Chichester Cross. There was no named leader and so between us we sorted out a route and off we went - Gill, Christine, Harvey, Mike Ann and Avryl. We went to Singleton via Centurion Way, along the valley to the A285 at Upwaltham,down Duncton Hill turning right at the bottom,through Shopham and Fittleworth to the Wyvale Garden Centre. Here we met Alan, Liz and Eric who had come partly by car and train respectively. This was our lunch stop. Alan led us up by Pulborough Station on a round trip bringing us back to the A283 and Wiggonholt where we stopped for tea. We returned to Chichester via Amberley Walberton and Oving. None of us had a computer but the estimated length of the ride was 45 mls. Sunday 28 August. A Sunday Ride in Kent. Over the Bank Holiday Weekend I joined in a long weekend trip organised by John Maxim to Tunbridge Wells. There were 5 on the trip the other 3 being Phil and Mary Turner and Richard Boulton from Arun Adur Section. Weather was great being dry but cloudy on the Saturday and warm and unbroken sunshine on Sunday and Monday. Sunday dawned with clear blue skies and a full English breakfast all round. 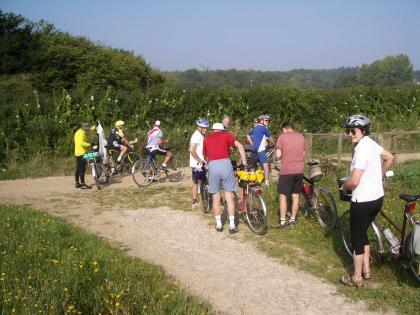 Tunbridge Wells is just over the border into Kent from East Sussex and the plan was to do a circular route further east into the Garden of England via Tenterton and Bewl Water Reservoir. The morning started with a bit of culture as we headed first for the ruins of Bayham Abbey. We arrived at 10.00 and the abbey was closed till 11.00. We opened the gate with the No admittance sign which we didn't really notice and cycled up the long driveway. We got a good view of the Abbey ruins from the car park. There was a bit of time for photographs as Phil struggled to get the timer on his Camera to work. Next we headed a mile up the road to Scotney Castle. We cycled slowly up the entrance driveway and I was looking down at my Camera at the crucial moment when everybody in front slowed to decide on route. I swerved but not in time and caught the edge of Phil and Mary’s Tandem and came off. Luckily no bones were broken but lots of gravel rash on arm shoulder and leg. No damage to bikes and even the camera escaped unscathed. Lots of wet wipes were used and elevenses was switched to outside the Castle shop while I recovered. We headed on via a few more hills to the ridge at Goudhurst. John suggested I must be feeling better after I got up a few of the hills ahead of everybody else. We stopped for lunch at the Bull in Benenden beside the village green and Cricket pitch. We decided to miss out Tenterden and John found some lanes and lots more hills before we stopped for tea at Bewl Water cafe at the visitor centre. Mileage for the day was 50.7. Return on Monday was across the Ashdown Forest and a great elevenses stop at Heaven Farm south of Danehill. Then on to lunch at the Duke of York, Sayers Common and Tea at Wiston.